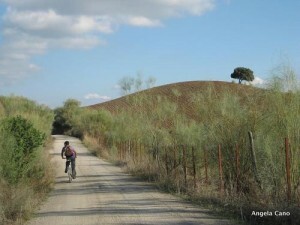 The Via Verde de la Sierra is one of 20 so-called ‘green routes’ which chart a trail of disused railway lines across Andalucia. 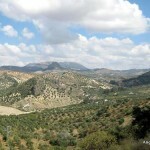 Forming part of a proposed rail route across the Cadiz Sierra between Almargen and Jerez de la Frontera, it would have connected the cities of Malaga and Granada. Although much of the groundwork, including tunnels, viaducts and railway stations were completed in the early 1930s, the project was never finished and lay in neglect until 1993 when the line was renovated for use as a walking and cycling route. 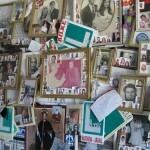 We started our day in the town of Olvera where we were staying in the charming Casa Andalus on Calle Maestro Amado. 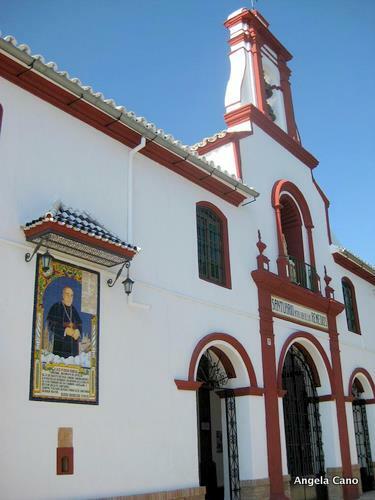 Like many of the other white towns in the vicinity, Olvera’s roots are Roman and the town went on to flourish during the Muslim occupation of Spain. 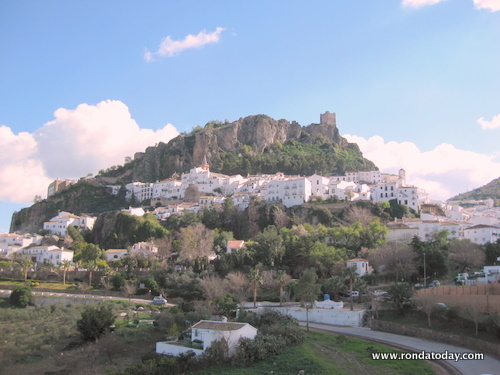 It has a Moorish Castle constructed on a rocky crag high above the town which, like parts of our own Moorish castle, was built during the 13th Century Nasrid Dynasty. Some of the original Moorish walls and their supporting buttresses remain intact, but most of the Castle was built after the reconquista. 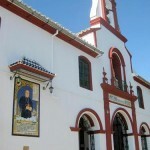 Another noteworthy building in the town is the twin-towered neoclassical church of Nuestra Señora de la Encarnación whose impressive façade dominates its surroundings and was built on the site of a former mosque. 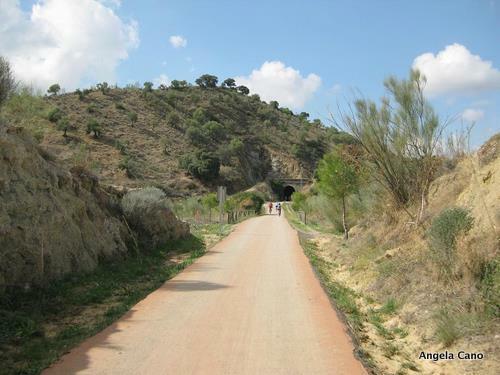 We followed the short though steep path from the town centre down to the Antigua Estación Ferrocarril which marks the starting point of the Via Verde. This hotel offers bicycle rentals and is the last opportunity to pick up refreshments before you reach the Estación de Zaframagón, 15 km along the route. 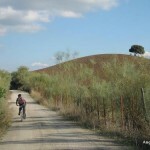 The reasonably flat terrain makes the route perfect for cyclists and we opted to hire bikes, although plenty also chose to follow the route on foot. We were immediately impressed with the scenery, a distinct patchwork of brown and green fields with endless olive tree groves looking like blobs of green paint on a watercolour just asking to be painted. 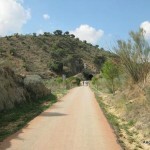 The Via’s thirty tunnels are a feature of the journey and we overcame nine of these before reaching the first official rest-stop at Estación de Navalagrulla. Although we had enjoyed a slight downward gradient thus far and barely broken into a sweat, we would be following the route in reverse on our return later and enjoyed a welcome respite, noting the need to conserve as much energy as possible. As we got closer to the Estación de Zaframagón, the landscape began to transform from arable land into forests of Spanish Firs. We were transported through mountains and river valleys with the help of immense viaducts and increasingly lengthy tunnels. The viaduct at Zaframagón offered inspiring views of the Peñón de Zaframagón, an impressive 584m-high limestone outcrop with sheer cliffs, and the verdant valley below strewn with delightful stone ruins. Overhead we saw our first venue of about a dozen Griffon Vultures. Two hundred breeding pairs live in these mountains and there is a nature centre dedicated to them at the nearby Estación Zaframagón which includes a video feed showing live footage of the vultures on the opposing rock face. The centre closes daily at 16:00 and a vending machine, which is available until that time, provides another opportunity to get much-needed refreshments before reaching the town of Coripe. Although we had originally intended to end our cycle at the Zaframagón we were feeling relatively spritely and decided to soldier on to the next Estación. 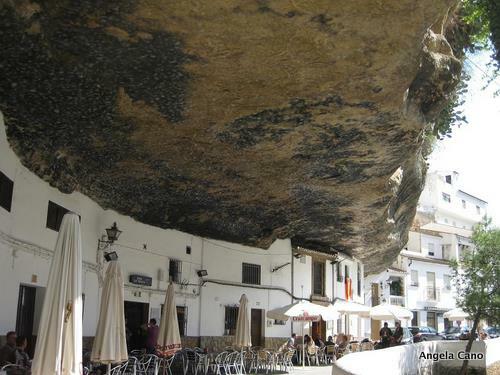 The Guadalete and Guadalporcún rivers join at around the 26 km mark of the route but the Guadalporcún meanders alongside the cycling track all the way from Zaframagón to the Estación de Coripe which has also been transformed into a hotel and restaurant. 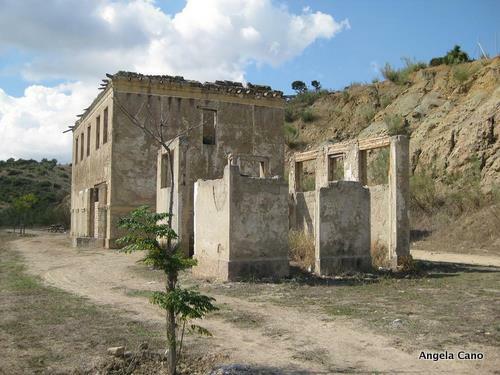 There is not much happening in the town of Coripe itself which is about 2 km from the track however a small diversion from the Coripe Viaduct takes you to the Chaparro de la Vega. This supposedly 700-year old Holm Oak of enormous dimensions is an Andalucian National Monument and plays its part in local traditions by providing a meeting point for the villagers of Coripe on their annual pilgrimage during the Fiesta del Virgen de Fatima, their patron saint. 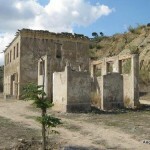 Following Estación de Coripe, the route continues to the third and final hotel at the Estación de Puerto Serrano which adjoins the town of the same name. However having already cycled 22 km we were acutely aware of the 200 metre height climb on the return route and set off on the arduous journey back to the start. About 2 hours later and with tired legs and saddle sore beginning to rear its painful head, we arrived at the hotel at Olvera, dropped off our bikes and were happy to place our feet firmly back on terra firma. Our walk back to town was slow but pleasant, not only for the sense of achievement we felt for having completed our long cycle, but also due to the beautiful purple and pink Sierra sunset that accompanied us on our way. We were aware that our legs would soon be stiffening up, so grabbing a quick shower at Casa Andalus, we headed out for an early dinner at the lively Restaurante Lirios before retiring to what was always going to be an excellent night’s sleep. Though predictably sore and stiff from the previous day’s cycle, we opted for an early rise and a trip to the Ermita de Nuestra Señora de Los Remedios which overlooks Olvera from a nearby hill. This sanctuary, built on the site of an 18th Century hermitage is apparently visited by 300,000 devotees each year who bring offerings to the Señora in fulfilment of their vows. The interior of its colourful chapel is a pastiche of numerous gaudy styles dominated by a shocking amount of gold plating, and stands adjacent to stunning courtyard overrun with potted plants. 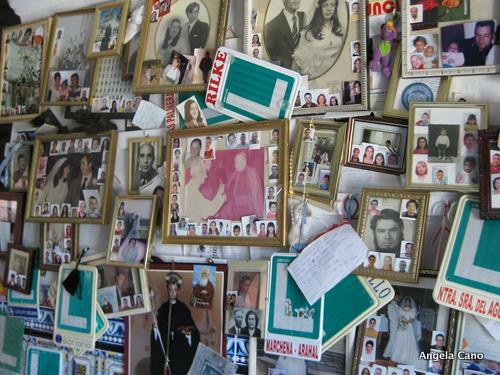 A room upstairs was undoubtedly the most interesting, housing the devotions deposited by visitors: hundreds of photos, items of clothing, locks of hair and numerous other knickknacks set down often in memory of long passed loved ones. 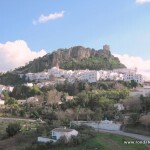 Next on the agenda was the village of Zahara de las Sierra where the remains of a castle recall its day as a Moorish outpost. Despite its small size (population of about 950) thousands of visitors are attracted to Zahara each year by its picturesque setting perched atop a mountain, overlooking a valley and a man-made crystal blue lagoon. 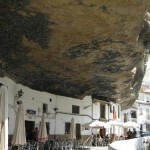 After a quick photo stop, we moved on to Setenil de las Bodegas, possibly the most unique town in the area. After driving through twice, we finally managed to find a parking space to explore this fascinating town where many of the houses are built into the walls of a huge mountain gorge. Setenil shows evidence of human occupation for at least 2,000 years but was possibly occupied by troglodytes long before then. 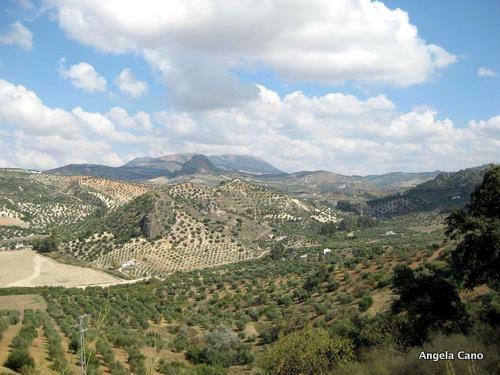 Olvera can be reached either via Ronda (taking the E-15/AP-7 in the direction of San Pedro de Alcántara and then the A-397 to Ronda, followed by the A-374 and following signs for Olvera) or via Jerez (taking the A-381 to Jerez/Los Barrios/ Seville and then the E-5/AP-4 to Seville, before taking exit 80 towards Arcos de la Frontera). Casa Andalus is a ‘self-catering’ house which can be booked by calling Karen/Andrew on +34 951276249, mob. +34 689665342). Bicycles can be rented at the Antigua Estación Ferrocarril hotel at the start of the Via Verde at the price of €15.00 per day.